corridors with a light tunnel. 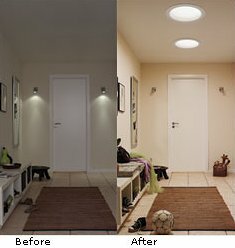 Many houses have bathrooms, hallways and other rooms where daylight only enters when you open the door. Dim and dark, these rooms are unwelcoming places until you turn on the light. Now that has all changed. Sun Tunnels signal the end of dim and dismal spaces in the home, bringing natural light into even the darkest and most isolated spaces through a specially designed tunnel from roof to ceiling. Options available to suit either pitched roofs or flat roofs. When converting an interior space into a loft isn’t possible, VELUX has the perfect solution to let sunlight into your darker spaces. Our Rigid Sun Tunnel is ideal for areas such as hallways or interior bathrooms in a single story home. 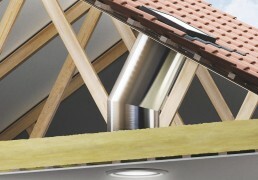 VELUX also makes installation simple, regardless of your roofing type. For flat roofing, install our integrated, grey aluminium frame with flush flashing. For profile roofing, choose our black polyurethane frame and lead-free lower flashing. 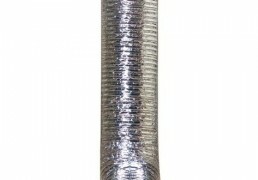 Suitable for roof pitches from 0-15o. 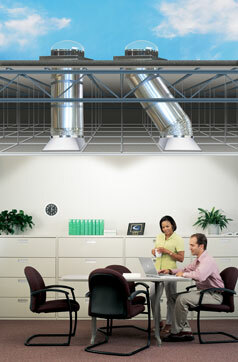 The SLT light tunnel is a completely new FAKRO product designed to bring ample natural light to every part of a property. It makes it possible to illuminate all rooms in a building, even those which cannot be fitted with roof windows or vertical windows. Dimly lit interiors such as bathrooms, dressing rooms, corridors, staircases or basements can be particularly uncomfortable to use, but now, thanks to the light tunnel, natural light can be used throughout a building to enhance the user’s comfort, and save electricity. The SRT light tunnel has a rigid light transmitting tube, made of aluminium and covered on its surface with a silver based, highly light reflective (98%) layer. The inside of the tube looks like a mirror, and this type of light transmitting tube ensures that daylight can flood the building interior. The SRT light tunnel can be used in every kind of building, but because of its high effectiveness, Fakro recommended installation in buildings where the daylight is transmitted into long distances (e.g. 12 m). 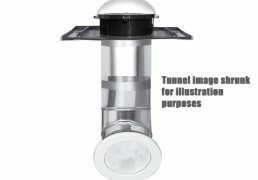 The SRT light tunnel can be also used at night with the addition of a light installation kit.